Kunia, Hawaii – Gov. David Ige can recall spending youthful summers working at the cannery near the once sprawling Del Monte pineapple plantation in Kunia on the island of Oahu. The school bus he rode every day passed Kunia, and when he and his classmates saw a flashing yellow light there, they knew they were close to home. At one time, the plantation employed hundreds of workers. Del Monte operated for nearly a century – from 1916 until 2007 – and offered employer-provided housing to the farmworkers. When the company shut its doors in 2007, some 500 residents not only lost their jobs but faced losing their homes, too – some had lived there for generations. 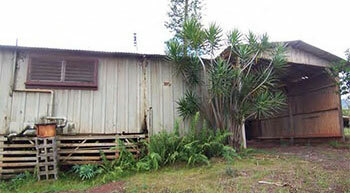 The Hawaii Agriculture Research Center (HARC) recognized the urgency to provide Kunia’s active and retired agricultural workers with sustainable and affordable housing, so it acquired the 119 acres of land from the then-owner James Campbell Corporation for $1 with an agreement to continue to provide affordable rental housing at the site. Many of the homes, some of them half a century old, were in severe disrepair; the entire rehabilitation project – along with building new homes – required not only a funding commitment, but also technical know-how. For this, HARC sought out a partnership with Rural Community Assistance Corporation (RCAC) in 2010. RCAC and HARC began an eight-year-long preservation project to save the homes for the families. RCAC provided financing, development expertise and environmental technical assistance. Kunia Village is RCAC’s second development partnership. Gov. 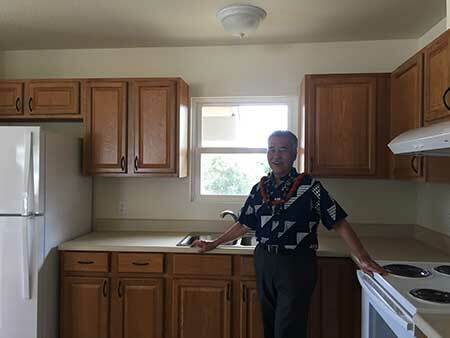 Ige takes a tour of a Kunia Village home during the August 2017 blessing ceremony. Since February 2016, construction crews have labored to rehabilitate Kunia Village, and in August the first phase, including 82 rental homes, of the massive Kunia Village preservation was completed. A ceremony to observe the momentous occasion drew Gov. Ige back to the village. “It truly is the last of its kind,” he told reporters during the ceremony. Most of the homes at Kunia Village date from the 1930s and 1940s. “Those original homes were old, beat-up, in really terrible condition,” says Paul Ainger, RCAC’s Development Solutions manager. “The water pressure was also terrible. In all, 18 of the homes had to be demolished because no matter what, they would have been unfit for housing.” He added that each new home cost on average $400,000 to build, in part because they needed new and extensive site work including water, sewer and electrical work. Other added costs included new carports for each home and a new water booster pump to eliminate the water pressure problem. It took planning and patience, says Denise Boswell, an RCAC rural development specialist in Hawaii. She notes that RCAC submitted a successful U.S. Department of Agriculture (USDA) Rural Development 514 Farmworker Housing loan application in July 2010 for Phase I.
RCAC later received a low-income housing tax credit allocation from the state of Hawaii; and RCAC’s Loan Fund provided a $1,841,583 predevelopment loan to HARC for predevelopment costs. Kunia Village’s historical significance is such that it was added to the State and National Registers of Historic Places in 2014. This designation enabled the project’s investors to take advantage of National Historic Credits. Clearly this complex financing package required that RCAC bring its extensive knowledge, skills and experience to secure the debt and equity required for the project. There were numerous challenges along the way. Second, the financing structure caused a few delays. First, RCAC applied for competitive 9 percent credits in Hawaii but did not receive an award. This caused another year’s delay. Then RCAC combined its two Rural Development 514 awards so that it appeared the financing would be feasible with 4 percent credits, which are awarded based only upon meeting threshold requirements. 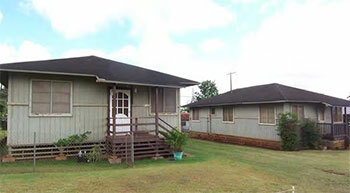 The Hawaii Housing and Finance Development Corporation (HHFDC) awarded Kunia a 4 percent credit and tax-exempt bond allocation in November 2013. But even with the HHFDC award, the project required USDA Rural Development to transfer its 514 commitment from RCAC to the newly-created limited partnership. The transfer took more than nine months because it had to go through the USDA national and legal offices. Further, the federal historic designation took more than a year, finally coming through in December 2014. Meanwhile, construction costs increased. Construction finally began in February 2016 and was completed in August 2017. As part of the financing package, the project secured one of the largest permanent loan commitments in the USDA Rural Development 538 guarantee program history, almost $9 million, and Hawaii’s first ever. Wells Fargo Bank provided Kunia with a $20,935,000 construction loan from a tax-exempt bond allocation to renovate 45 existing rental units and to demolish another 18 before constructing 37 new rentals for the farmworker families, many of whom have extremely low median family incomes. RCAC’s loan fund matched this with more than $6 million in construction financing. “Despite the obstacles and delays, RCAC and HARC persevered to see the project through to completion. RCAC learned valuable lessons which will inform the organization’s approach to future development partnership projects,” says Michael Carroll, RCAC’s former director of Housing and Lending. In the redevelopment’s first phase, the 37 new homes were designed to resemble the existing plantation-style homes. Renovation work on the existing homes included foundation, floor and wall repairs, new wiring, painting, roofing, light fixtures, appliances, cabinets, countertops, sinks, toilets, showers and tubs. Further, the construction included adding a second bathroom to the three- and four-bedroom homes, and each home now has a two-car covered carport. “Difficult as it was, the results are evident – ask the residents – and I believe RCAC would do it again,” Carroll says. Natalie Wong, her husband and three children (ages 10, 8 and 2), more than welcomed the chance to live at Kunia Village. She and her family had been living in a duplex in Makaha, Oahu. Their dwelling was very small, almost like a cabin, she says, with no yard, and no place for her children to play outdoors. When her husband, a native Hawaiian who works as a fisherman, learned of Kunia from his employer, she went online to learn more. Wong’s husband has aunts and uncles who had lived and worked there, she notes. A bus picks up her children to take them to school, and Wong especially enjoys a nearby farmer’s market, as well as the convenience of a post office within the village. A fellow resident, Lisa Macadangang, is equally pleased with her new home. A single mother of two children, ages 14 and 11, Macadangang has no familial connection to Kunia, but she works for a corn seed company in the agricultural sector. She helps with sorting and husking the corn, as well as packing and shipping it. Her employer also told her about the opportunity to live at Kunia Village. “I was living in Honolulu and commuting to work about 30 minutes each way,” she says. Her rent for a two-bedroom home in Honolulu cost $1,200 per month. At Kunia, her new home has three bedrooms and costs less than $800 per month. The rents are set at 30 percent of household income because all of the homes in the project have USDA project-based rental assistance. “It’s brand new and very comfortable,” she says. Noah Unabia is also a new Kunia resident, along with his wife and three-year-old son. He grew up on a farm on the northernmost part of Oahu and met his wife while both were working at farmers’ markets. They also work on a family farm and for a local honey company. They keep their own bees and also sell eggs at a farmers’ market and through a food co-op. Unabia recalls one of his first impressions of Kunia. “On the first day we were living there, I saw a new kid on the block,” Unabia says. “He took his bicycle out, pedaled awkwardly and fell down many times. Two older boys pedaled alongside him and helped him to learn. Each one with a hand on the handlebar. The boy learned to balance. The boy’s mother later told me that he was very sunburned, scraped and bruised, but so happy! As the residents continue to build a sense of community, HARC ultimately hopes to continue the work and provide up to 200 affordable rental units for agricultural workers in the next 20 to 30 years. The ongoing restoration work includes a community center, a tot lot, commercial space, warehouses, offices and a wastewater treatment plant. 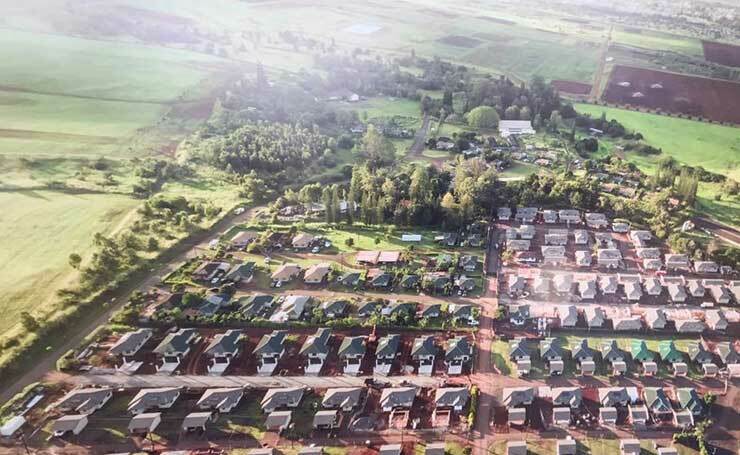 Three more construction phases are planned: the first is to repair and maintain 51 legacy homes using Kunia Village resources, and the following two phases include constructing 67 additional affordable homes through self-financing. At a blessing ceremony last year and at the recent one in August, many residents who were born and raised children, grandchildren and great-grandchildren at Kunia were in attendance – surely a sign that the hundreds of planned homes will be needed in the coming years.